2013 Harley-Davidson 1200 Custom 110th Anniversary. Picture credits - Harley-Davidson. Submit more pictures. Each Anniversary Edition Harley-Davidson is a unique masterpiece, with its very own work of art marking it as part of this historic celebration. Forged of solid bronze and plated with black nickel, each Anniversary medallion is then distressed to highlight the bronze. And since no two can ever distress the same, each becomes a completely unique commemorative �sculpture.� The finishing touch is a bold gold cloisonn� showing the Harley-Davidson Bar and Shield. Price as new (MSRP): US$ 11699. Prices depend on country, taxes, accessories, etc. Comments: Special Edition celebrating HD�s 110th Anniversary. Ask questions Join the 13 Harley-Davidson 1200 Custom 110th Anniversary discussion group or the general Harley-Davidson discussion group. Rate motorcycles you know and help your fellow riders to find the bike that is right for them. Bikez has the most users and the most extensive motorcycle rating on the net. It includes reliability, design, engine performance, accident risk, repair cost, offroad capabilities, racing track capabilities and touring capabilities. The ratings are also used to rank the 100 most popular MC models each year since 1990. The lists	are adjusted weekly as new ratings are added. 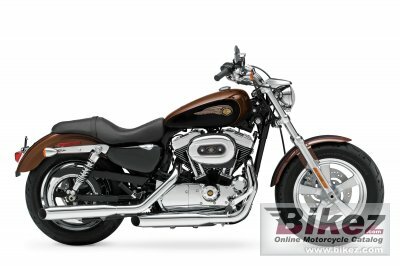 You can check out the rating of the 2013 Harley-Davidson 1200 Custom 110th Anniversary and compare it to other bikes here.